Offering consulting services in sales and marketing, internationalization, universal design, access technology and photography. Typically less than 10% of U.S. businesses sell products overseas or to people in other countries. But think about the growing diversity of the U.S. market itself. There are Hispanic communities where they speak only Spanish. The second most common language spoken in homes in Los Angeles is Korean. Many school districts from New York to Texas to California have student populations who speak 50 or more languages in their homes. Whether you actively pursue selling products outside the borders of the United States, the international markets of the world are coming to the U.S. Describe the typical person you call the "customer". What are the common characteristics? Where do they live? What level of education have they reached? As discussed in the Demographics and Culture sections of the website, how people approach your marketing message and what features of your product appeal to them depend to a great extent on the culture in which they live, the income available for purchasing imported products and the values they hold. Let Mullins Imagination help evaluate whether the features and benefits of your product match the target you are trying to reach. Analyzing the customer's "wants" and "needs" and motivation could uncover additional markets for your product, or question whether the features of the product are appropriate to the desired market. Some people might argue that sales reach their full potential in markets with no competition. However, it can also be argued that having multiple companies promoting similar products increases development of the market and provides customers with choices. Customers with no choices exhibit reluctance believing a single supplier may not fairly represent the advantages and disadvantages of a product. Especially with regard to new technologies, when alternatives exist customers have more than one source to determine the viability of a new product concept. Therefore, entering a market as a second supplier has several advantages: the early entrants have already developed the market for the product, the later entrants provide customers with choice and the additional promotion from multiple companies will reach more potential customers and ultimately increase the market size. But beware, that introducing a product very late can also give a competitor time to solidify a strong position in the market. Focus groups, surveys, product testing and individual user interviews provide the great sources of information on the popularity of competitive products and takes a significant amount of time to analyze the wealth of data gathered. Mullins Imagination can gather the data you need to make decisions and provide clear recommendations to approach competitive pressures. Mullins Imagination has developed extensive expertise regarding the approach to selling products outside of the United States. Having marketed and sold products in over 150 countries and negotiated with clients face to face in 58 of those countries, in five languages, few other organizations can provide similar insight and guidance. Check out the "Accomplishments" section for specific examples of sales success. Even though your company sells products exclusively to customers in the United States, be aware that the U.S. Department of Commerce (DOC), U.S. Export Regulations require sellers to know whether the end customer resides outside of the United States. Other areas of business that the DOC monitors include sales and exports to suspected terrorists, prohibitions on exports to specific countries, restrictions on certain technologies, cooperation with foreign boycotts contrary to U.S. law and sales to violators of U.S. law. The Bureau of Industry and Security maintains a list of "Denied Persons" with whom it is illegal to do business. You can find complete details of the DOC regulations at http://www.export.gov. Don't Let This Happen to You is a publication of the U.S. Department of Commerce that provides actual examples of export violations that were both intentional and unintentional. Other agencies of the U.S. government also regulate the activities of U.S. companies when products and services are sold for use outside of the United States. The Department of Justice enforces the Foreign Corrupt Practices Act which covers restrictions on gifts to foreign government officials that may be considered bribes. Many other countries have laws that prohibit bribery as well. The U.S. Treasury Department houses the Office of Foreign Asset Control which enforces restrictions on exports to promote specific policy goals such as anti-terrorism, narcotics trafficking, diamond smuggling, and nuclear proliferation. There are restrictions on the export of most consumer products if the final destination is Cuba, Iran, or North Korea but other countries to which the U.S. limits exports include the Balkans, Belarus, Burma (or Myanmar), Democratic Republic of the Congo, Cotes d'Ivoire (Ivory Coast), Iraq, the Sudan, Syria, and Zimbabwe. Check out the OFAC website for updates on the most current restrictions. Product development requires realistic objectives to define the "wants" and "needs" that the product will satisfy for a specific target market. The worst mistake a company can make is to define a product to try and satisfy too many customer needs. Another common mistake is trying to release a "perfect" product. There will likely always be deficiencies that would be "nice to have" features but not necessary to the success of the product. Delay in a product release can jeopardize the company bran and delay revenue streams. Designing a product for a specific market is called "localization". When that market lies outside the U.S. people commonly refer to it as "internationalization"; and when a product is designed for a worldwide audience it is called "globalization". Common issues to consider for any of these issues include the language or languages of the target market, local regulations, electrical standards like UL and CE, and cultural issues like birth control products, charging interest in Muslim cultures, etc. The most important advice to properly localize a product is to properly define the target market and insure that the features and benefits of the product match the wants and needs of the customers. Of the 6 billion inhabitants of the globe fewer than 500 million speak English as a first language. Although it is the most common second language with over 2 billion speakers, the vocabulary, dialect and inflection varies widely from the Bronx to Mumbai. Developing customer instructions, training materials, labels and other language-related accessories need to take these differences into account. Global Second Language developed the concept of "intercultural English" which describes differences between usage of English based on cultural perspectives. Americans use frequent metaphors related to baseball and football, such as "home run" and "touchdown" or "huddle", but using these types of terms can create misunderstandings when communicating with individuals from other cultures. Developing products for a truly global market presents significant obstacles since some products are more suited to a global market than others. Advanced medical devices are commonly marketed the same way around the world because so many physicians take medical courses in English. But food products, health and beauty products are designed for very specific markets and cultures. Just translating labels would hardly be sufficient to sell the products in multiple countries unless marketing to similar cultural enclaves in third countries. For example, the Chinese or Asian food industry is very successful in California where foods and spices from Asia are imported specifically for immigrants from their native communities in Asia. But when a product cannot be sold across cultures, it is not considered a global product. Many companies today offer foreign language translation of websites using machine translations. The free or low cost sites usually use strict lists of translations word by word. Since all languages have words with multiple meanings based on context, no one has developed a product using this method to translate documents without significant errors. As enticing as it may be, there are none that translate language well enough to understand without great effort. However, there is a technology that uses "translation memory". Rather than taking words and looking up a possible translation from a dictionary, translation memory products store words, phrases and terminology in context. When the translation memory database is applied to a new document covering a similar subject, the translation memory identifies linguistic segments that match instances in the new document and ranks the probability of an exact match. A human bi-lingual editor then takes the prospective matches and modifies the translation memory suggestion to create the best translation of the new phrase. The new phrase is then stored in the translation memory for use when it occurs again later in the document or in a future document. Translation memory then grows as new phrases are translated by humans and stored in the database. The translation memory technology is not perfect because it would not be very useful to apply the translation memory of a scientific topic to a child's book. Given this limitation, translators who edit a wide variety of documents will save multiple translation memories to use to translate new documents within a limited context. And companies that regularly translate their products develop translation memories that very closely match the vocabulary they use in future products. Using translation memory developed from several instances can save a company up to 80% of the cost of an original translation. Society has progressed a long way to include people with disabilities into every walk of life. When we realize that people with disabilities were often institutionalized, it is amazing to recognize the accomplishments of individuals like Helen Keller and Professor Stephen Hawking who provide us with images that challenge the stereotypes of handicapped people as beggars. But over the last 30 years, technology has been developed to help compensate for many different disabilities enabling individuals to compete with peers based on their abilities rather than isolating them for their disabilities. In 1990, President George Herbert Walker Bush signed the Americans with Disabilities Act (ADA) which was the first civil rights legislation for people with disabilities. It recognized that when people with disabilities have the opportunity to use appropriate technology, they can be just as productive as non-disabled individuals. The Act mandates that employers make an effort to recruit and provide qualified employees with the tools they need regardless of their disability. It also provides for federal funding of adaptive equipment through the Social Security Administration when the cost of such devices would create a hardship for the company. The ADA introduces a new concept called "reasonable accommodation" which means an employer is responsible to invest in a disabled employee just as they might make an investment in other employees. The Act specifies that accommodation must be "readily achievable". Companies have a responsibilty to make an investment proportional to the severity of the disability to enable a disabled person to function as any other employee in a similar position. However, small companies are exempt and even large companies do not have to make large investments that might result in an "undue burden". Since the bill's passage, courts have limited the scope of the law and reduced the expectations on the companies but the principle that discrimination on the basis of disability is still illegal. Definitions can be found in Sec.36.104 Definitions of Title III. The ability to "see" is embedded in our culture. Expressions such as "look over there", "did you see that?" cannot literally apply to someone with a vision disorder but imply an inherent expectation that everyone has vision. Experience has found that the majority of people with a vision impairment quietly tolerate expressions like this but it illustrates how a dominant culture can unintentionally oppress some individuals. With the development of a tactile alphabet by Louis Braille in 1824, visually impaired individuals learned to read and write documents independently. In the late 1970's, technology like the Optacon enabled people with no vision at all to read printed materials after being trained to recognize the tactile shapes of letters on an array of 144 pins. Later, reading technology for use with computers included optical character recognition (OCR) for scanning printed documents and converting the image of the page to alpha-numeric electronic files. Screen reading software which finds and extracts text from a computer application, can take OCR data and send it to speech synthesizers for a blind person to hear. 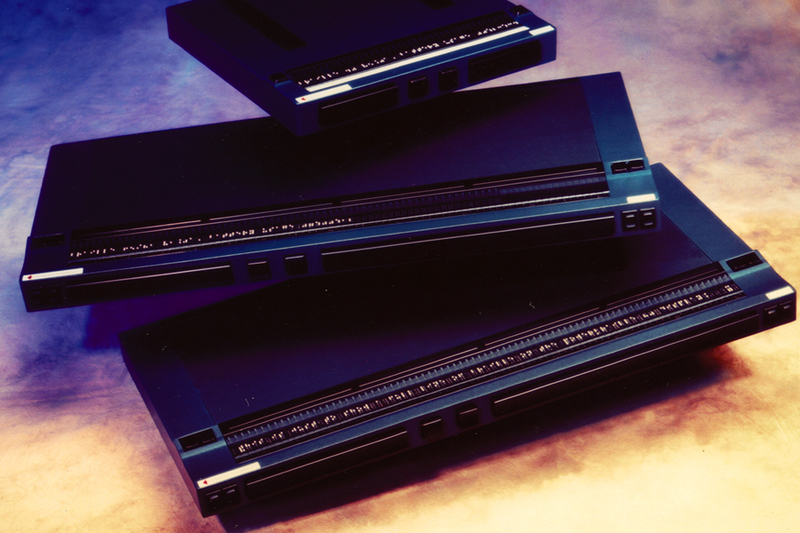 Refreshable Braille displays were developed to work with screen readers to display text in a tactil format that corresponded to Braille code. Lines of Braille "cells" where pins in groups of six or eight, moved up and down to represent a letter displayed on a computer screen. The cells were laid next to one another in lines of 20 to 84 cells to represent longer sections of text. Such "refreshable Braille" technology is still widely used but as computer applications use more graphics and images, there exist increasing challenges for ways to represent non-alphabetic content. For jobs than require an employee to read and manipulate text, screen reading software, synthetic speech and refreshable Braille are essential adaptations to enable a vision impaired person to compete in the workplace. Many vision impaired people work with spreadsheets and programming languages just as well as sighted colleagues. As computer technology advances, new adaptations will be necessary to enable vision impaired people to work. Contact Mullins Imagination if you have any questions about adapting a workplace for a person with a vision impairment. Stairways, gravel walkways, printed signs and curbs present significant barriers for people with disabilities. Imagine 100 story skyscrapers without elevators. Would you walk the stairs to the top floor? No, we expect an elevator to take us up. Now imagine an elevator that can't accommodate a wheelchair. The person in the wheelchair would have great difficulty climbing the stairs without the use of their legs or legs and arms. But people without a physical disability expect an elevator to carry them up the skyscraper. Why shouldn't a person who uses a wheelchair expect that all elevators accommodate them? Would it be such a terrible expense to install a slightly larger elevator so everyone can ride together? When was the last time you attended a conference and listened to speeches for hours? Did you have to bring your own chair? Why not? Because it's terribly difficult for most people to stand for hours, but a person who uses a wheelchair brought their own chair! Why should their registration fee pay for you to have a chair? Did the auditorium have lighting? Why didn't turn off the lights? A blind person doesn't need the lights to move around, why do we who have the sense of sight expect hallways and buildings to be lighted? Are you reading this website with a lighted computer monitor? A blind person can read the screen without one? Why should employers provide computer screens for all their computer users? Why not let everyone use screen reading software? When you think about all the accommodations most people expect employers to make, you may realize that slight modifications in design can accommodate everyone. The key to "universal design" is planning! Just as you have read about adapting products for different languages and different cultures, assume that some members of your target audience will have disabilities. How many will have disabilities? What disabilities will be represented in population of your market? These are questions that any market analysis needs to answer. Rather than pouring concrete to create curbs, plan ahead and include ramps or "curb cuts" from the beginning. Wouldn't you agree that the marginal cost of designing the accommodation from the beginning dwarfs the cost of ripping out an inaccessible barrier to allow passage of a wheelchair? Even the Worldwide Web Consortium (W3C) has developed standards of accessibility for websites so that screen readers and Braille displays can easily find the text, so that mouth controls can click objects like a mouse, so that speech recognition can enable a quadraplegic to vocalize commands that a computer understands. No such standards exist, yet, for off the shelf software but shouldn't product managers and engineers think about people with disabilities who will use their products? Ask us how to incorporate universal design into your company's product development. Developing imagery for marketing materials and product documentation may include graphics or photographs. Please review the sample images in the photo galleries to get an idea of the types of photographs available in our archive of 50,000 images. Or if you need individual photographs of your products, please let us know and we can schedule photoshoot on site or on location.